← Getting Fat – Part 2 – We’re Having A Baby! Do you have a food kryptonite? That one thing you know you can and will devour in 30 seconds or less given half the chance? My food kryptonite is powdered donuts. The little Hostess donettes, to be more specific. No matter how stellar my will power is, I will eventually succumb to the deliciousness that is those sweet little calorie bombs. I would take the last one out of my kids’ hand if it came down to it. I eat them so fast they make a paste in my mouth. My face is covered with so much powdered sugar I look like I just stuck my face in a 5 gallon bucket of powdered sugar. (Wait, do they make those?) Oh, I digress. I don’t bring those suckers in my house. That’s what works for me. In fact, my whole family knows we can’t have them in the house because I can not eat them in moderation.My daughters think it’s funny. The hubby just shakes his head (let’s see how his will power would withstand chicken wings in front of him all the time!). I love sweets. 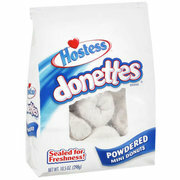 However, those Hostess donettes are one thing I can’t just have a few of and walk away from. I know I will eat that whole bag. Oh yes. The.Whole.BAG! The chocolate ones? Well, I can just have one or two and be fine. So, all powdered donuts are banned from my house. (Perhaps I was single handedly responsible for their bankruptcy? Yikes!) I may appear to be a super hero(ish) but I do have my kryptonite. Why would I walk right into it? I don’t. No powdered donuts in my house. That’s what works for me. This entry was posted in Finding Balance, Goal Setting, What Works For Me Wednesday and tagged balance, Eating, What Works For Me Wednesday. Bookmark the permalink. Hi Chrystal! I used to love those lil” white circle of deliciousness until I was watching some show I can’t even remember the name of. The man on the show had to go to some eating disorder place. He was very overweight and his weakness was also the powder doughnuts. The doctors on the show made him chew one up spit it out on a plate, put it back in, chew it, spit it over and over. It was so disgusting to watch it cured me FOREVER!!! I almost can’t eat any doughnuts after watching. Just wanted share the disgustingness, in case you want a cure and not just a prevention. While I loved the white powder doughnuts, my absolute fatal weakness is CHOCOLATE. Until I found out that slaves pick cocoa beans of most chocolate we get here in the states. I have managed to quit that, too. Except the free trade kind. Too bad its so expensive!! Or maybe that is a blessing! Free trade???? I think I meant fair trade…oops! Good thing it isn’t free or I’d be in big trouble. Great blog. Always interested in fitness. Thanks for coming by my own site as well. Appreciate it! Thank you! Mmmmm….popcorn. I like mine with the cheddar cheese salt. 🙂 Your blog is awesome. Appreciate you checking out mine.